For generations, immigrants left their homes for a new land, and of homesteading farms on some of the millions of acres of virgin soil. But now the land is under threat from giant agribusiness corporations, many of them owned by investment bankers, real estate developers, and, more ominously, by the threat of climate change, which is literally squeezing th last drops of water out of once-fertile soils. While the first threat seeks to end the role of the smallholder, the latter two change the very nature of the land itself. We come from a long line of farmers. The first Brennemans were political refugees, fleeing religious persecution in Europe in the 1600s in search of farmland in Pennsylvania, a colony founded by a religious dissident to provide a safe haven for other religious dissidents. We know that small farmers care about their land, developing intimate relationships with each contour, learning which patches of soil bring the highest yields and which need special care, while investment bankers obsess only over the bottom line. Many farmers agonize over the growing corporate control of their own land in an age when companies genetically alter the crops they plant by retaining ownership of the seeds themselves, barring farmers from doing what farmers have done for millennia — saving seeds from this year’s crop to grow next year’s harvest. And then there are the patented chemicals made by those same corporations, chemicals needed to grow those same patented crops. Like vultures, investment funds circle America’s wounded businesses and institutions, waiting for the opportunity to swoop in and harvest “troubled assets” everything from apartments and newspapers to — since the crash of 2008 — America’s farmland. “We’re seeing growing interest in farmland acquisition, and we are seeing new investment vehicles being developed, but we have no idea what it means for small and mid-sized farmers,” said Fairbairn, who received a $150,000 grant from the U.S. Department of Agriculture to study “farmland financialization” in areas of peak agricultural production in California and Illinois. Until about 2008, financial services companies looked askance at buying farmland, but today, they are snapping it up at an impressive pace: As an example, Fairbairn says TIAA, the leading retirement investor for the academic community, owned no agricultural land before about 2007; today, TIAA controls $8 billion worth of farmland globally, investing on behalf of itself as well as other institutional investors. A rural sociologist, Fairbairn has tracked the trend since it first emerged. She has attended agricultural investment conferences where “farmland funds” were pitched to potential investors, and witnessed the development of investment vehicles that cater to the phenomenon, including publicly traded real estate investment trusts (REITs) that first came on the U.S. market in 2013. “Land ownership is a really important part of agriculture, but one that most people spend very little time thinking about,” said Fairbairn. 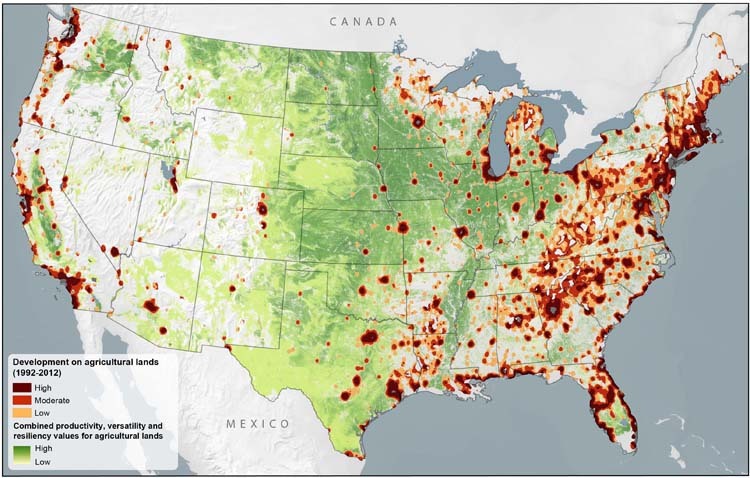 California and Illinois represent two poles of U.S. agriculture: California is dominated by high-value specialty crops and “permanent crops” like almonds and wine grapes; land is very expensive; and corporations already are major players. Illinois produces commodity row crops like corn and soybeans, and is home to more small, family-owned farms. There’s another force at work too, and that’s overseas investors. Consider, for example, the Saudi royals, who have been scooping up American soil, buying acreage to raise hay to feed the imperial horses. [B]etween 2004 and 2014, the amount of agricultural land held by foreign investors doubled from 13.7 million acres to 27.3 million acres — an area roughly the size of Tennessee. While representing only about two percent of total farmland, the value of the foreign-owned U.S. farmland soared from $17.4 billion (in today’s dollars) to $42.7 billion during that same time period, according to U.S. Department of Agriculture data. Most of today’s foreign investment in agricultural land began to increase in 2005, according to the Midwest Center’s analysis. Of the top foreign investors who own agricultural land, nine bought most of their land between 2004 and 2014, about $8.1 billion worth of farmland, the Midwest Center found. Worse still are those threats that destroy the land itself. Of the two, we’ll consider the less threat first — the destruction of land through development. The development of agricultural land is shown in relationship to the low-to-high continuum of productive, versatile, and resilient values for agricultural land. The conversion of agricultural land to urban and low-density residential uses between 1992 and 2012 is shown as high (dark brown-red, > 25% conversion within a 10-kilometer (6.2-mile) radius], moderate [light brown-red, 10–25% conversion] and low [tan, 5–10% conversion]. Urban areas are shown in gray. The final threat up for consideration today is the long-term and destructive impacts of global warming on the soil itself. As any farmer can attest, soil is more than just inert dirt. Each soil is a complex ecosystem, harboring microbes that process soil minerals, digest dead organic matter, and release carbon dioxide, methane, and other greenhouse gasses. Crops favor specific soil types as well, requiring significant levels of fertilizers when planted in less-favorable soils. A considerable body of science reveals that changing water levels changes the microbial community, and the drier soils become, the fewer species of soil microbe can thrive, resulting in a collapse of soil biodiversity. Dry months are getting hotter in large parts of the United States, another sign that human-caused climate change is forcing people to encounter new extremes. In a study published today in Science Advances [open access], researchers at the University of California, Irvine report that temperatures during droughts have been rising faster than in average climates in recent decades, and they point to concurrent changes in atmospheric water vapor as a driver of the surge. UCI’s research team analyzed observed temperature and precipitation data from the early and late 20th century and discovered that regions undergoing droughts warmed more than four times faster than areas in the southern and northeastern United States with average weather conditions. In addition, climate models showed a significant warming shift in Southern states between the late 20th century and early 21st century. These changes point to a greater number of droughts and heat waves co-occurring. This can lead to such calamities as wildfires and loss of crop yields. Widespread conflagrations, spurred on by abnormally high summer temperatures, are currently burning around the world, including in parts of California, Scandinavia and Greece. He suggested that society has a responsibility to respond to the challenges presented by this new climate reality. This study was partially supported by the National Oceanic & Atmospheric Administration. Nothing is more priceless and more worthy of preservation than the rich array of animal life with which our country has been blessed. It is a many-faceted treasure, of value to scholars, scientists, and nature lovers alike, and it forms a vital part of the heritage we all share as Americans. I congratulate the 93d Congress for taking this important step toward protecting a heritage which we hold in trust to countless future generations of our fellow citizens. Their lives will be richer, and America will be more beautiful in the years ahead, thanks to the measure that I have the pleasure of signing into law today. The law passed with unanimous support in the Senate, with only four House Republicans voting no. Despite the limited knowledge we possess, there are 2269 animals and plants in the U.S. and its territories identified as endangered, a number certain to grow as our knowledge base expands. In a series of announcements. . . Trump administration officials and their Republican allies in Congress announced actions intended to weaken key portions of the Endangered Species Act. If implemented, these regulatory changes in agencies as disparate as the National Oceanic and Atmospheric Administration and the Fish and Wildlife Service could wholly transform the intention of the act by allowing economic considerations to supersede environmental concerns when classifying animals as “endangered or “threatened.” The changes would also shift the balance of authority from federal regulators to the states and strip protections from several animals whose habitats pose a nuisance for developers and oil firms. Stakeholders who benefit from these rollbacks do not reflect the majority of voters, or even the Republican Party, but their viewpoint, closely aligned with the GOP and Trump, has become ascendant in recent years. “There’s been a pretty long-term campaign against the Endangered Species Act, really for 20 to 25 years,” said Andrew Rosenberg, director of the Center for Science and Democracy at the Union of Concerned Scientists. Now, with Republicans in control of both chambers of Congress, the administration’s outspoken promise to protect the fossil fuel industry, and a president who has promised to revoke two regulations for every additional one he implements, the time is ripe for the campaign against the act to succeed. While the real estate developer in the Oval Office sees the Endangered Species Act as an obstacle to his real estate empire, the American public remains solidly behind the law’s protections for our fellow critters. In the past two years, nearly 150 amendments, bills and riders aimed to weaken the U.S. Endangered Species Act. However, a new study indicates that four in five Americans support the act and this support has remained stable over two decades. The Endangered Species Act is portrayed – by critics of the law, often by the media, and sometimes by conservation professionals – as increasingly controversial, partly due to the protection of species such as wolves and spotted owls. These portrayals suggest that public support for the law may be declining. However, new research indicates that support for this law has remained consistently high over the past two decades. The fresh survey data and analysis are laid out in a new paper, published last week in the Society for Conservation Biology’s journal Conservation Letters[open access], by a team from Michigan Technological University, the Ohio State University and California State University. Because of the rift between citizens and government officials, the authors say the Endangered Species Act has joined the ranks of issues like gun control and climate change where political action veers from public opinion. I am fighting every day for the great people of this country. Therefore, in order to fulfill my solemn duty to protect America and its citizens, the United States will withdraw from the Paris Climate Accord — (applause) — thank you, thank you — but begin negotiations to reenter either the Paris Accord or a really entirely new transaction on terms that are fair to the United States, its businesses, its workers, its people, its taxpayers. So we’re getting out. But we will start to negotiate, and we will see if we can make a deal that’s fair. And if we can, that’s great. And if we can’t, that’s fine. Trump’s agenda is simple: Anything that gets in the way of the aspirations of billionaires to become the world’s first trillionaires must be abolished, even is millions of deaths ensue. What else would you expect from a narcissistic real estate developer [and always remember that he is precisely and simply that]. And from our decades on reporting on real estate developers, we have learned that they hate nothing more than environmental regulations. In pulling out of the Paris Agreement, a document signed by 179 nations thus far, Trump has donned another executive title, Mass Murderer-In-Chief. Among the many consequences of his anti-environmentalism will be a massive spike in global deaths associated with the heat waves that have set new records and spawned a lethal rash of wildfire across the globe. We developed a model to estimate heatwave–mortality associations in 412 communities within 20 countries/regions from January 1, 1984 to December 31, 2015. The associations were used to project heatwave-related excess mortality, with projected daily mean temperature series from four scenarios of greenhouse gas emissions during 1971–2099. We used three scenarios of population changes (low, moderate, and high variant) and two adaptation scenarios (no adaptation and hypothetical adaptation). If people cannot adapt to future climate change, heatwave-related excess mortality is expected to increase the most in tropical and subtropical countries/regions, while European countries and the United States will have smaller increases. The more serious the greenhouse gas emissions, the higher the heatwave-related excess mortality in the future. If people have ability to adapt to future climate change, the heatwave-related excess mortality is expected to still increase in future under the most serious greenhouse gas emissions and high-variant population scenarios. However, the increase is expected to be much smaller than the no adaptation scenario. If people cannot adapt to future climate temperatures, deaths caused by severe heatwaves will increase dramatically in tropical and subtropical regions, followed closely by Australia, Europe and the United States, a global new Monash–led study shows. Published today in PLOS Medicine, it is the first global study to predict future heatwave-related deaths and aims to help decision makers in planning adaptation and mitigation strategies for climate change. Researchers developed a model to estimate the number of deaths related to heatwaves in 412 communities across 20 countries for the period of 2031 to 2080. The study projected excess mortality in relation to heatwaves in the future under different scenarios characterised by levels of greenhouse gas emissions, preparedness and adaption strategies and population density across these regions. Study lead and Monash Associate Professor Yuming Guo said the recent media reports detailing deadly heatwaves around the world highlight the importance of the heatwave study. “Future heatwaves in particular will be more frequent, more intense and will last much longer,” Associate Professor Guo said. A key finding of the study shows that under the extreme scenario, there will be a 471 per cent increase in deaths caused by heatwaves in three Australian cities (Brisbane, Sydney and Melbourne) in comparison with the period 1971-2010. “If the Australia government cannot put effort into reducing the impacts of heatwaves, more people will die because of heatwaves in the future,” Associate Professor Guo said. The study comes as many countries around the world have been affected by severe heatwaves, leaving thousands dead and tens of thousands more suffering from heatstroke-related illnesses. The collective death toll across India, Greece, Japan and Canada continues to rise as the regions swelter through record temperatures, humidity, and wildfires. Associate Professor Antonio Gasparrini, from the London School of Hygiene & Tropical Medicine and study co-author, said since the turn of the century, it’s thought heatwaves have been responsible for tens of thousands of deaths, including regions of Europe and Russia. “Worryingly, research shows that is it highly likely that there will be an increase in their frequency and severity under a changing climate, however, evidence about the impacts on mortality at a global scale is limited,” Associate Professor Gasparrini said. Associate Professor Gasparrini said he hoped the study’s projections would support decision makes in planning crucial adaptation and mitigation strategies for climate change. March, 20th is the United Nations’ International Day of Happiness, recognising ‘the importance of happiness in the lives of people around the world’. Bhutan is credited as the first country to have implemented the concept of ‘Gross National Happiness’ as an official measure for the state of a nation, introduced in 1972. After the global financial crash in 2008, ideas about giving the ‘spiritual, physical, social and environmental health of [people] and natural environment’ more prominence over mere economic development are reflected more and more in international efforts towards a sustainable future. The Happy Planet Index (HPI), developed by the New Economics Foundation, takes a rather radical approach on this issue. It aims to measure well-being and happiness by taking a universal and long-term approach to understanding, how efficiently people in a country are using their environmental resources to live long and happy lives. The indicators that are used for calculating the HPI score cover life-satisfaction, life expectancy, inequality of outcomes and the ecological footprint. As argued in the report, ‘GDP growth on its own does not mean a better life for everyone, particularly in countries that are already wealthy. It does not reflect inequalities in material conditions between people in a country.’ This explains why consumption patterns are seen as more important for well-being than production. It also acknowledges that inequalities in well-being and life expectancy are important factors in the overall happiness of the population in a country. When taking these notions into account, the rich industrialised countries score much worse in achieving sustainable well-being for all. Of the 140 countries included in the HPI, Luxembourg is the most extreme example for a wealthy nation scoring very badly – it does well on life expectancy and well-being, and also has low inequality, but sustains this lifestyle with the largest ecological footprint per capita of any country in the world. It would require more than nine planets to sustain this way of life if every person on Earth lived the same way, showing that the standard of living comes at a high cost to the environment. Among the positive stories is Costa Rica, which is also highlighted on the map. The country has persistently scored highest in all HPI releases (the 2016 edition is the third, after 2009 and 2012). 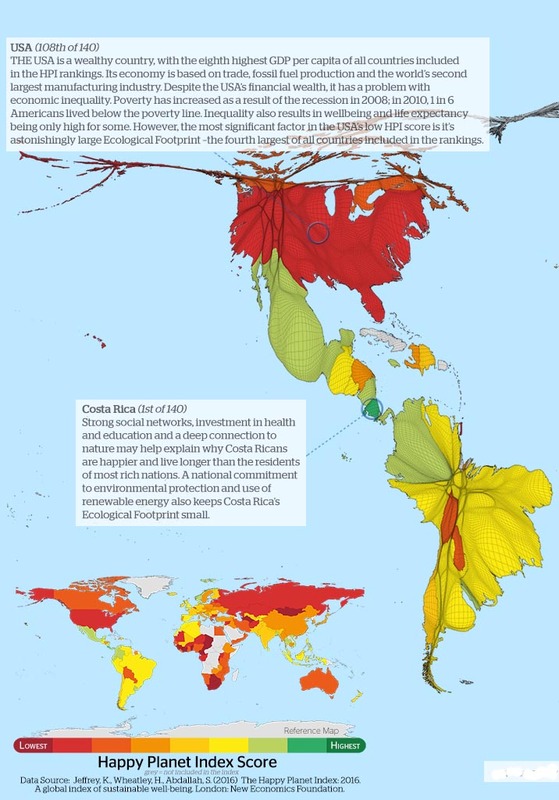 More of a surprise might be the high score for Mexico (second), which is credited to massive efforts at improving health and environmental sustainability. Despite challenges with tackling inequality, well-being is perceived higher than in the wealthier northern neighbour, the United States. Quite a few Central and South American nations, as well as some Asian and Pacific countries do better than many wealthy nations. However, the African continent shows that at the bottom end extreme poverty can be a limiting factor in achieving sustainable well-being. Two significant graphics from Unearthed: land, power and inequality in Latin America, a major study of land distribution in Latin America, reveal the gross inequalities of land distribution in the Americas. Latin America is the world’s most unequal region in terms of land distribution. The Gini coefficient for land—an indicator of between 0 and 1, where 1 represents the maximum inequality—is 0.79 for the region as a whole, 0.85 in South America and 0.75 in Central America. These figures indicate much higher levels of land concentration than in Europe (0.57), Africa (0.56) or Asia (0.55). 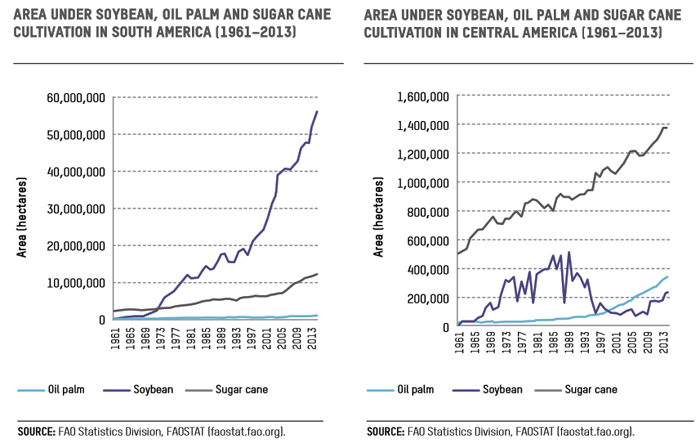 cients above 0.80, while the ratio is over 0.90 in Chile and Paraguay. Compared with the distribution of income—for which Latin America is also the most unequal region in the world—land distribution is even more inequitable. The regional Gini coefficient for income is 0.48 compared with 0.79 for land, and is higher than in Sub-Saharan Africa (0.43), North America (0.37) or the East Asia-Pacific region (0.37). Note particularly the vast acreage devoted to soybeans. South American farmers are expected to sow 57 percent more area with Monsanto Co’s second-generation, genetically modified soybean seed Intacta RR2 Pro in the new planting season, a company executive said. Intacta, which tolerates the herbicide glyphosate and resists caterpillars, was planted on 14 million hectares in Brazil, Argentina, Paraguay and Uruguay in 2015/2016. Farmers are expected to plant 18 million to 22 million hectares this season, Maria Luiza Nachreiner, head of South American soy operations, said in an interview before Monsanto announced it would accept a $66 billion takeover bid from rival Bayer. “We have a positive outlook this crop,” Nachreiner said. Intacta will account for 31 percent to 38 percent of the planted area in Brazil, Argentina, Paraguay and Uruguay, up from 24 percent this season, she noted. Monsanto does not release specific numbers about the area planted with its seeds in Brazil, the world’s largest soybean exporter. For years, its Roundup Ready Soybeans dominated the regional GMO seed market, peaking in 2013/14 with 84 percent of Brazil’s soybean area, according to data from local consultant Celeres. To maintain those crops, farmers are also basically forced to use Monsanto weed-killers, most notably glyphosate, the main chemical ingredient in the company’s Roundup,. Roundup has been linked with a growing number of human health problems, but weeds have been growing tolerant, forcing the company to create new blends featuring even more toxic chemicals, including 2,4-D, one of two chemicals used in the toxic Agent Orange blend sprayed over much of Southeast Asia during the Vietnam War, resulting in a growing number of severe infant deformities. We spent a good many years covering environmental issues, including the role played by corporations and the nation’s largest university system in building on polluted land. We were first stirred to concern for our impact on the environment in 1962 when we read Rachel Carson’s Silent Spring, the book that inspired the rise of the modern environmental movement in the last half of the 20th Century. And while Donald Trump may share a leak paranoia with Agent Orange, he’s anything but Richard Nixon when it comes to the environment. While Trump and many of his appointees called for outright elimination of the EPA, realism set in. The proposal, sent to the EPA [last week], would cut into grants that support American Indian tribes and energy efficiency initiatives, according to the source, who read the document to Reuters. State grants for lead cleanup, for example, would be cut 30 percent to $9.8 million. Grants to help native tribes combat pollution would be cut 30 percent to $45.8 million. An EPA climate protection program on cutting emissions of greenhouse gases like methane that contribute to global warming would be cut 70 percent to $29 million. The proposal would cut funding for the brownfields industrial site cleanup program by 42 percent to $14.7 million. It would also reduce funding for enforcing pollution laws by 11 percent to $153 million. The budget did not cut state revolving funds for programs, that Congress tapped last year to provide aid to Flint, Michigan, for its lead pollution crisis. All staff at a research program, called Global Change Research, as well as 37 other programs would be cut under the plan. More than 40 percent of EPA’s budget – about $3.5 billion – is dedicated to state and tribal grants used to pay for staff and support an array of programs, including initiatives that protect drinking water. State clean air and water programs also benefit. That means the disproportionate burden will fall on states, most of which have Republican-controlled legislatures and chief executives. So it’s unlikely most states will replace the lost funds, and layoffs will ensue. Also impacted will be city government, losing both federal funds and monies from the states. Given that the burdens of pollution fall disproportionately on the poor, life expectancies may decline. Hey, but he’s makin’ Ahmurka great agin, ain’t he? Needless to say, climate research is involved. More than a dozen federal agencies, including the U.S. Geological Survey, the Interior Department and the Department of Energy, conduct climate research. Further cuts are expected, particularly at NASA, which develops and launches the satellites that provide invaluable information on climate change used throughout the world. President Trump has called global warming a “hoax,” and some congressional Republicans pushing for climate science cuts have falsely claimed that federal scientists are engaged in a massive conspiracy to defraud the American public into thinking that human activity is causing the planet to warm. About a third of the American economy relies on weather, climate and natural hazard data, said Chris McEntee, president of the American Geophysical Union, the nation’s largest scientific organization. She said much of the federal scientific research and data comes from multiple agencies working together, so cutting one will have a ripple effect. “It’s not just one agency, it’s a holistic view here, and cutting one piece also has an impact on the whole enterprise of what we get out of science from the federal government that enables us to have the kinds of tools and information we need to protect the infrastructure, to protect lives, to protect public safety, and to give us knowledge and information to make a more effective economy and country,” she said.